Living at university is great, but one thing I struggle with has to be food. I like cooking everything fresh, so much so that I don't own a space in the freezer as I don't need it. It does get hard at times because the option of having a takeaway is always there - mainly Domino's. Who can resist when its 50% off? If it isn't pizza then it's Chinese which is just as worse. But its all ok because Naked Noodle exists - a brand that has created different flavored noodles that are healthy, tasty and inexpensive! 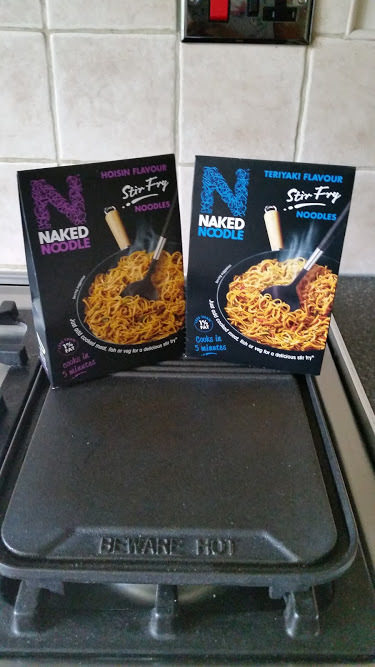 I got the chance to review their Snack Pots and Stir Fry Range and after basically eating nothing but noodles for the past week I am slightly in love and ready to report back. As far as packaging goes it definitely entices you the images of the noodles look tempting and the coloured lids match the rest of the packaging. The snack pots are great for a quick lunch especially if you have like 15 minutes and need to hurry, there are 8 flavours in the range and I have highlighted the ones I have tried in bold - Thai Sweet Chilli, Cantonese Hoisin Duck, Malaysian Laksa, Thai Tom Yum, Vietnamese Beef Pho, Japanese Teriyaki, Singapore Curry & Chinese Chow Mein. 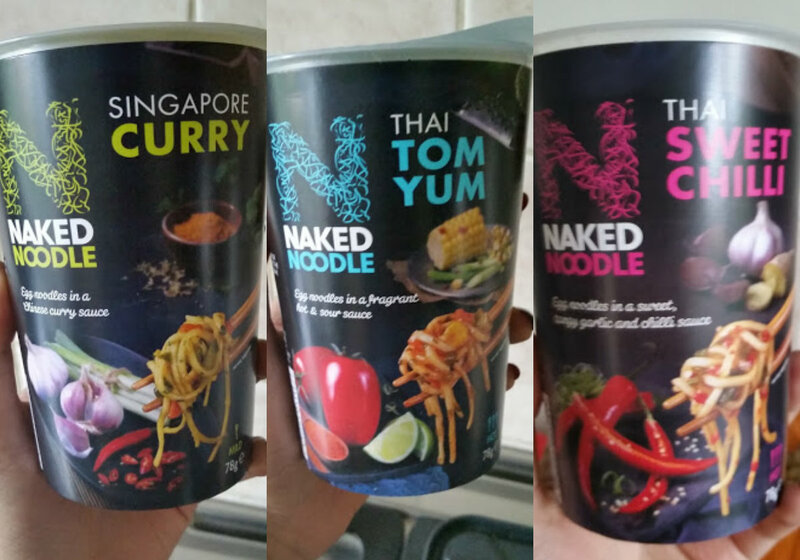 One thing I love about all of the Naked Noodle range is that it is all suitable for vegetarians (full list of ingredients here)! This sold me straight away. They are also really easy to make, boil the kettle, pour the water up to the fill line, leave for 4 minutes, stir & enjoy! As it sits to rest the smell of the pot fills the room. Singapore Curry - This pot is by far the most flavour filled one. As soon as you eat a spoonful you are hit with lots of different spices. The main ones been ginger and garlic and then something else came through to me after wards and that was a hint of chilli - it was odd because the three main ingredients are so simple yet powerful and delicious. 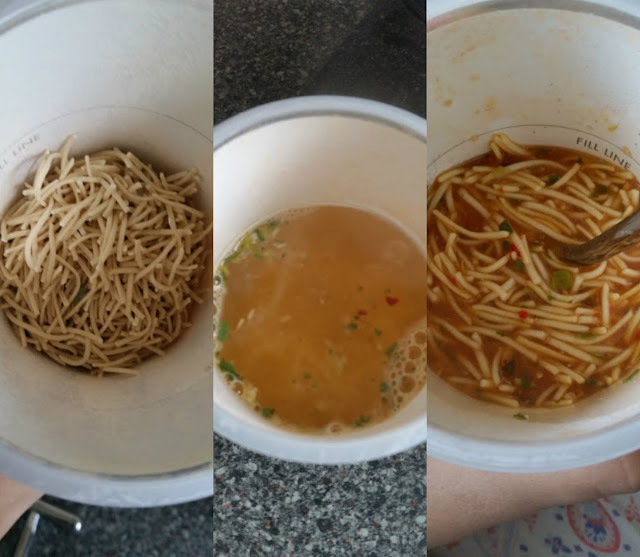 Thai Tom Yum - This was a weird one for me to try, as I''m not the biggest fan of Thai food, however these noodles taste like sweet and sour that you order from the takeaway. It's chilli yet has a tomato base and the mix is amazing. Then a hint of sourness comes through from the lime which put me off at first but I gave it a stir and it was all good. This has a good kick to it though so be warned if yo try it and aren't a fan of spicy because wow this got me at first. Thai Sweet Chilli - This one is my favourite of the three I tried. I am still dreaming about it now after eating it, it is good food in a pot. It has a slight kick of chilli in it and mixed with a tangy taste it is delicious. If you have ever tried any form of a sweet chilli sauce or crisps then you will love this its warming to mouth and perfect on a cold day. Then we have the food that looks and tastes absolutely delicious! These are just 1% fat and around 200 calories per pack - great for those of us on a restricted diet. The stir fry packs can be eaten on their own similar to the snack pots or as a side dish - I added some mushrooms to mine (favourite vegetable) and it was even nicer! I forgot to take pictures of my amazing meals for these, but have purchased some more so will take a picture and add it in as soon as I have had them - promise. They come in a range of flavours - Teriyaki, Singapore, Sweet Chilli Chicken, Chow Mein & Hoi Sin. Of the two I tried Teriyaki was my favourite added with mushrooms and some other random veg it was amazing and managed to fill me up - which noodles don't usually do! 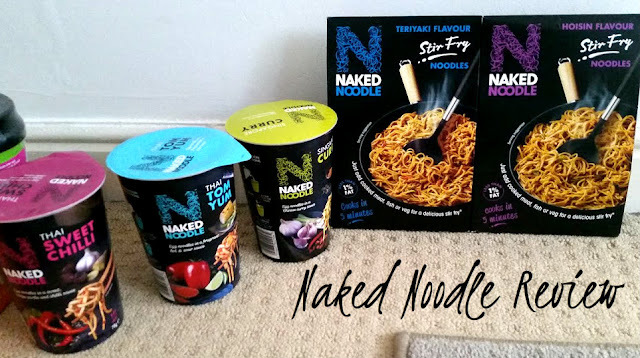 I highly recommend trying Naked Noodle if you get a chance university student or not they are amazing, cost next to nothing and well deserve love! You can find them at all major supermarkets at £1.20 for a the stir fry and £1.71 for the snack pots!